I still don’t know how that catapult got up there. I love Wintergrasp. It’s a fight over a resource-rich zone, and unlike some other zones that get called that, this is not just flavor text. The winning side gains tangible benefits both for combatants and non-combatants alike. There’s real value in victory. Stone Keeper’s Shards and Wintergrasp Marks offer attractive gear for both you and your alts at the vendors who spawn when you control Wintergrasp Fortress, the Vault of Archavon becomes available, and the Essence of Wintergrasp is applied across all of Northrend, helping your entire faction. The goal is simple: take control of Wintergrasp Fortress, or defend it until time expires. But Wintergrasp is big, and confusing, and how you do this simple goal is not apparent. Your first few matches are often spent with very little idea how you can contribute. There are no obvious markers to guide you, no mad scramble or charge you can join in that says this is the right thing to do. First, let’s get familiar with the zone. The northern part of Wintergrasp is dominated by Wintergrasp Fortress and the Temple Workshops. This is where much of the heavy fighting will rage during a battle. There are some subtle terrain differences on each side, but you should find the Flight Points for each side (Horde is west, Alliance is east) because this is where the offenses will zone in. The southern part is less populated during a battle, but is where you’ll find the Towers and Southern Workshops. Not everyone goes here during a battle, but it’s an important part of the defense, so we’ll talk about it more in a minute. The quest zones to the east and west are not tactically important during a battle. You can ignore them for now. I really recommend you ride around the zone before a battle begins to get an idea of where everything is located. Next up are the goals in Wintergrasp. On offense, you have one goal: get inside the inner fortress and click the Titan Relic in the center. This involves knocking down at least 3 fortress walls with vehicles: an outer wall, an inner wall, and the door to the relic chamber. Walls are knocked down by vehicles — siege engines are optimal for this task. A mass of 4-6 siege can often destroy a wall before the defense can stop them. On defense, you have a primary and secondary goal. Your primary goal is to keep the offense away from the Titan Relic for 30 minutes. Your secondary goal is to destroy the three southern towers, which takes 10 minutes off your defensive clock. Destroying the southern towers therefore means that you only have to defend for 15 minutes. Towers are destroyed with vehicles, too, often with a combination of fast-moving catapults and slow, lumbering siege. You no doubt noticed that each team needs vehicles to accomplish their victory goals. You can have 4 vehicles for every workshop you control, so the more workshops you control, the more vehicles you can field — and the fewer your opponent can have. So controlling the workshops is a shared goal for each side. One of the defining features of Wintergrasp are the vehicles. Once you have reached the rank of Recruit (5 kills) you can create fast, lightweight catapults, and Lieutenant (10 kills) gives you access to antipersonnel Demolishers and heavy, slow Siege Engines. You can only create vehicles if your side has available slots — check the battle status in the upper part of your screen for this information. You can create a vehicle by going inside a workshop you control and speaking to the gnome or goblin manning the controls. They’ll give you a choice of what you can build. Catapults are fast vehicles that are excellent for both taking down the southern towers quickly, as well as supporting larger vehicles during an assault. Catapults get a bad rap because they are easy to make, but that’s another advantage; if your side can field a lot of catapults early on, they can make a significant difference. However, cats take up slots that can also be filled by heavier vehicles, so as the battle progresses you should be swapping out catapults for siege engines. Siege Engines are heavy, lumbering rams that are essential to both offense and defense. They have a gun turret which should be manned if at all possible. They are hard for defenders to take down quickly, so a very good strategy is to mass siege at one of the workshops and then send 4-10 of them in a single group to overwhelm the defense. Most defenders can stop 1 or 2, but a concentrated mass of siege is usually too much to stop, especially if it is protected. Demolishers combine the good traits of both catapults and siege engines without excelling in either role. They are good support units for the southern tower offensive, as they are quick enough to move from tower to tower, but they are not as fast as a pack of catapults. They can stop other vehicles and take down walls, but don’t pack quite the punch of a siege engine. Demolishers are useful to have in your mix, but shouldn’t be your primary units. The vehicles take some getting used to. If you’re new I wouldn’t recommend piloting one right away, but instead watch and see how they are used in different situations. While they’re not vehicles per se, the defensive Cannons on the towers are worth a final word before moving on. The cannons are an integral part of defending any structure, be it the Fortress or the southern Towers. Cannons provide great ranged AoE DPS and having them manned in the right places is crucial to defending the walls. Conversely, knocking out any manned cannons is essential to the attackers to protect your siege. Cannons are easy to use, and for most characters, manning a cannon is a better contribution to your side than running around outside the walls. I say most characters, because there comes a point where either your crowd control or healing abilities are more needed out in the thick of battle than any contribution you can make from a cannon. If you’re a new 80 (or sub 80), new to PvP, or a tank, though: consider manning any empty cannon you find. 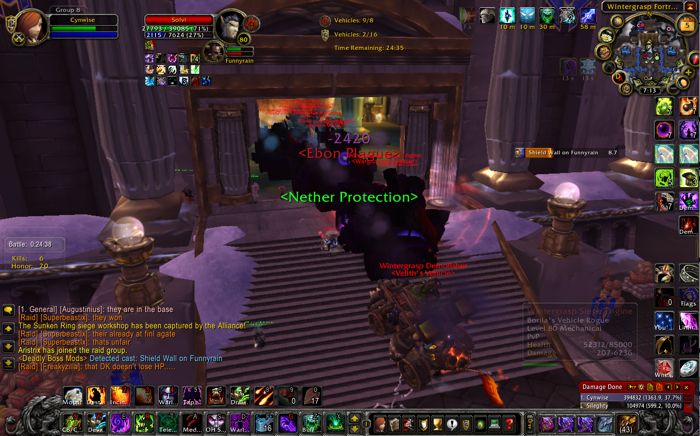 Depending on which side of the Tenacity buff you’re on, Tenacity is either the best or worst thing about Wintergrasp. Tenacity is a stacking buff applied to the outnumbered side and increases both health and damage dealt. It can be very, very potent when used properly. But it’s also relatively simple to overcome, because it has no effect upon crowd control. The best way to overcome Tenacity is strong crowd control and group tactics. Fear, stun, disarm, silence all still work, and ganging up on the opponent will usually overcome anyone with Tenacity. So the key to using it well is to play smart — don’t engage 20 opponents by yourself. Stick to the basics and let it work for you. One last note about Tenacity: complaining about it is worthless, and usually marks you as a bad player to the other players. It is an integral part of Wintergrasp, and you must learn to deal with it. Stick together and use your crowd control. There are many ways to win Wintergrasp. It’s not as straightforward a battleground as some of the more traditional ones – not only is each server’s composition different, but each battle has different conditions because of Tenacity. There are some general battle strategies that you will see repeatedly that are worth some discussion. Here are two of the most common. The Quick Punch involves the offense grouping many siege engines at a nearby workshop and making a single, huge push into the Fortress. If the defense doesn’t repel this first push, the offense wins very quickly. The Quick Punch: Watch out for big arrows, they’ll hurt! The key to making this push work is to make sure the defense is distracted and pulled away where you are actually going. Drawing the Alliance out front, or the Horde to the side, or either side to the south, will often make taking the Relic easy. Defending against the Quick Punch is simple in concept but hard in execution; everyone has to throw themselves at the mass of siege and stop them at all costs, or the rest of the battle will not happen. Calling out incomings is essential — if you don’t talk on defense, you will lose. Yes, I had red hair during this battle. It was weird. Sometimes, the opposing side will show up with a half-dozen Siege Engines within 30 seconds. This is possible for at least two reasons: Tenacity increasing the kill value of NPCs, and people logging out with the First Lieutenant rank and logging back in at the start of the value. It doesn’t matter how it happens; just be ready for it. QQing does nothing to help. The Long Siege is a more traditional battle for Wintergrasp. Pressure is applied to the Fortress to keep the defenders occupied while the southern workshops are taken. The defenders, in turn, repel assaults while destroying the southern towers. I’ll present this from the Alliance side on offense because that’s what I’m most familiar with, but the Horde strategy is very similar. The offense begins by capturing the nearest workshop (Sunken Temple) and moving people to the walls of the Fortress to get HKs and create siege. Staying behind the walls is actually a good idea at this point for the defenders, since it takes time off the clock while the offense racks up kills on NPCs. The offense should also send out squads to capture other workshops to increase the vehicle slots available to their side. After the initial assault on the walls, the offense should look to secure the remaining southern workshops and establish a modest southern defense, while building up their forces in the north. Holding the southern workshops will become more difficult as the defense starts to send groups south to the towers, so keeping a strong threat on the walls of the keep is important. Once enough forces have been build up in the northern workshops, waves of siege should be sent against the walls with the intent of punching through and creating multiple breaches for the defenders to have to deal with. Generally, if the offense can split the defense inside the keep, any one wave should be enough to overwhelm one wall and courtyard. But once the offense has access to the inner keep, the siege needs to pour at the Fortress door until the Relic is taken, or the wave is dead. At the same time this is happening, the defense should be mounting a concerted effort to get the southern towers down. The offense should make sure that they have enough defenders down at the workshops to keep at least one tower up, as futile a goal as that may be. If the defense strikes strongly enough at the south, the offense should immediately abandon all but the workshops and instead focus on getting in the Fortress as fast as possible. Most offenses should assume they only have 20 minutes, not 30. Wintergrasp is not a simple battleground to master. The epic battles make it hard to figure out what you should be doing at any moment in time. Hopefully this introduction will help you better visualize the ebb and flow of each battle and react appropriately — because of all the resource-rich zones in Azeroth, this is the one you want to control. Kudos. I’ve been looking for a simple and practical guide to Wintergrasp since I finally took the PvP plunge a few months ago. Thanks for this excellent guide. Any non-PvPers out there, this is THE battleground to start with. It’s really fun. Nobody will yell at you. Just run around at first and defend a tower if you are offense, or defend a wall if you are defense. You can also ride in a seige vehicle that someone else is driving, then pop out when it get’s attacked by other players. A ranged player or two can take out a vehicle in 30 seconds with focused fire. Thanks! I agree, Wintergrasp is a great battleground to get started in. Not only are the rewards great, but the pressure on you is very, very low. Find a group of people and go where they go. It’s really a blast. Thanks Cyn. I can’t believe I didn’t know about the three southern towers and the 10 minute timer reduction. Oops! Love love love the maps and diagrams! I’ve always been a little unclear on the difference between siege engines / demolishers, except that the former is more destructive. You label the latter as “antipersonnel” early on in your post and I’m curious what that entails exactly…I know I’ve been knockbacked by the ram on the front but is there something else I’m not paying attention to about that that makes it a decent people-killing machine? I’m *still* not sure that I totally know how to use Demolishers. I called them antipersonnel because the ram, combined with their speed, can do a number on massed troops. But it’s really not that different from the Siege Engine’s ram attack. A true antipersonnel weapon, like a flame pulse or mines would help better define its role in the battle. The lack of such a weapon probably means that while you CAN use ram to kill players, it doesn’t mean it’s the best way to do so. The demolisher is faster than the Siege and has a catapult which throws rocks that do 1000 damage to walls or players. Since its ram and the catapult are both controlled by the driver, I like to use it when we don’t have many players to man the Siege Engine guns, such as late weekday nights. Although it doesn’t have nearly the hp of the Siege, you can move faster and start attacking a wall at a distance without needing a gunner. Unlike the Siege, the 2 riders can do ranged attacks while mounted. If you put casters on a couple of demos and team up with your Sieges, you can crowd control the defenders from a protected position. If you only have a few players down south, the demo is the best choice, in my opinion. The siege is way too slow to move between the towers, and a lone cat takes a long time to down a tower. If you have lots of help, the cat is pretty good down south because it moves so fast between towers. And, you can usually get started on the towers more quickly by killing enough NPCs on the way south to make cats than by getting your kills at the Keep first then heading south. Cyn this guide has been very helpful. I’m going into pvp with my deathknight and i need a few trinkets from WG. Plus the enchants sold there rock. I really didn’t know how WG worked so i wanted to do alittle research. This guide answered all my questions. Thank you…..
NOOOOO! So, I googled looking for some kinda of diagram i could copy to show people WHERE to attack Wintergrasp since the east push on my server always hits the wrong wall, and I find…this guide, with diagrams telling everybody the wrong place to hit. Both sides should be hitting the REAR wall, as it’s covered by the least amount of cannons and has terrain that provides protection for parts of the way, there’s also less guns covering the route. First, this guide doesn’t claim to represent a particular best strategy. It represents the de jure strategies and doesn’t advocate any one route. I’d love to see more people run the back walls, but it’s hardly essential. The Alliance on Durotan tends to punch through the front gate, and it works because of superior numbers and focused firepower. Elegant? No. Good for the weaker side? No. But perfectly valid. The center allows access from both directions, allowing you to cram more siege into a single hole. Second, these maps aren’t that hard to make. If you have a particular strategy you want to tell others, take a screenshot of the map and draw your own!